so cute and so pink!!!!! love this pattern so easy to do and such a cute one . I really do apprecaite the time you take to make and share your original patterns with us. You are a blessing. I'm expecting my first great grandchild in the next few days, if it is a girl I will most certainly make this jacket and hat for her, it is truly beautiful, well done. There are no pieces to sew together, it is all crocheted. 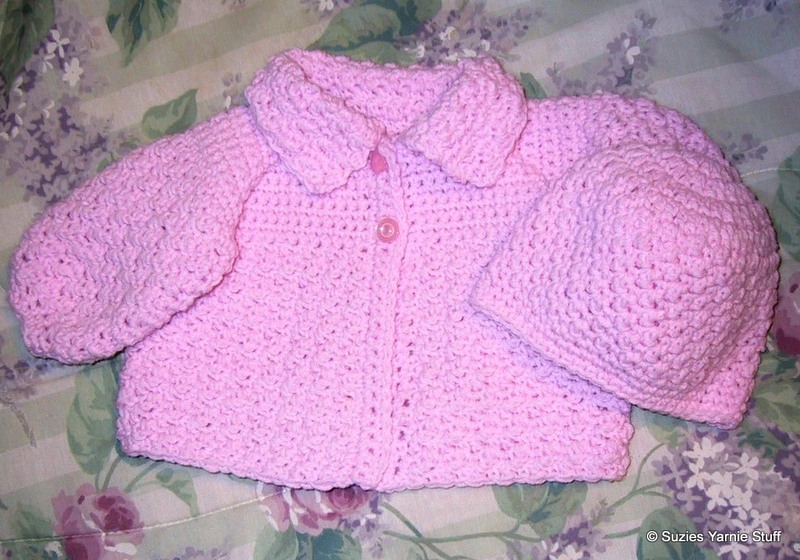 The body and collar are crocheted in one piece and then the sleeves are crocheted on. I made this sweater & hat pattern yesterday after work, and it is so gorgeous I had to thank you for posting it. I make baby clothing & afghans for a charity organization, and this is so easy and looks great! Hi Sue,I was in the process of crocheting a boys baby sweater for a friend when I decided the proportions were wrong and I absolutely hated it so I had to frog it!! I was limited as far as time and desperate. I begged my group (Barefoot Crocheters) for an easy pattern for a boy. Would you believe that four people from the group sent me the url to this pattern!! I knew it had to be good if four people gave the same pattern! By doing the top of the sweater white and the bottom blue it made a gorgeous sweater!! I sent pictures of it to all my friends and family which was a mistake because my sister absolutely loved it and asked me to make another set for a friend of hers. If you would like to see a picture of it I can send it to you if you would like just email me. Thank you again for such a great pattern. I fell in love with this sweater set! I was in the process of creating one for my friend but she stopped me before I could put the sleeves in because she said that her granddaughter was on the "chubby" size and that it was too small! I noticed that you said that larger sizes were coming, is that soon? If not where in your pattern would I do the increasing so that the sweater could fit a 12 month or 18 month sized baby? I haven't got around to the larger size. Keep watching and eventually I will get there. In the meantime, better select a pattern with the size you want, so your work isn't wasted. HI. Thanks for the patterns. I'm a crochet beginner, but the hat doesn't look too hard. I printed out the instructions, and started making it, but I'm getting a round circle, as opposed to a hat shape. What am I doing wrong? Starting with round 5 the sides of the cap start to take shape. I crocheted this pattern in a light orchid for my new granddaughter. It came out so pretty ! I love it ! It was so easy too. Thanks so much. No you don't fasten off. Only fasten off when told to. I found your pattern online when I was looking for some ideas for Redeemed Remnants, which was birthed after being given a number of large bags of left over yarn remnants. This sweater and hat were perfect for someone learning to do more than crochet straight lines. :) Thank you so much for posting your patterns which are easy to read. I am 17 years old and I have been crocheting for pretty much my whole life, I recently was able to put my frustrations of all the abbreviations away and finally read a pattern. I have a 6 month old baby sister whom I have been wanting to make a cardigan although this pattern is much to small for her. This pattern is so easy, not a lot to sew together. Suzie- how would you make this for newborn size? My friend just had a baby. I am planing on using 3 ply bernat baby yarn. Thank you! You could try that yarn with a smaller hook. I don't know how big it would turn out. Good Luck! I don't know the answer. Why don't you measure one next time you're in a store that has them. I used to have several baby garments that I used for sizing, but gave them away.